After finishing this piece this morning I had an epiphany … I am still stuck in the era I stopped painting. I switched to quilting art quilts, mainly landscape which kept up my sketching and drawing skills along with creating my own cross stitch and embroidery patterns. 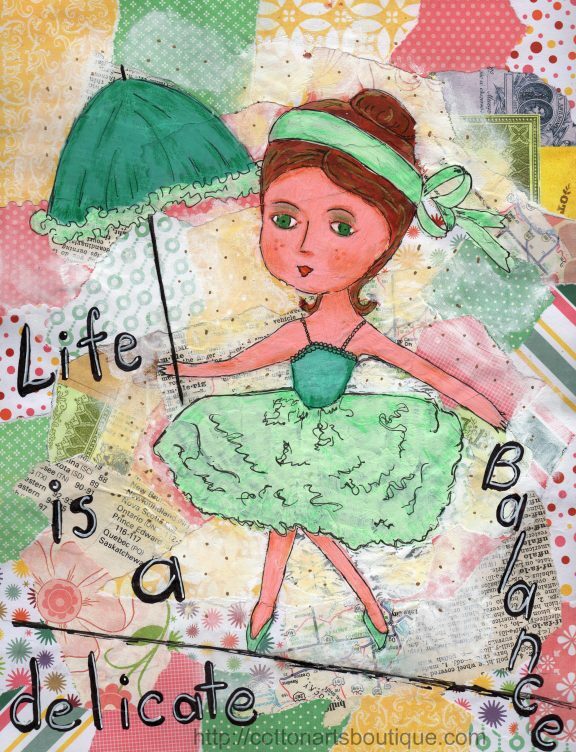 I then moved on to mixed media and digital and designing scrap book kits. I created many a background but have not done any serious painting in a long long time … thus the reason I am stuck. I want to redo many of these pieces and will do, but only after I have enough lessons done to feel mature in that area. It really is a shock to me to find my brain/hand co-ordination is not up to what my mind sees…. humbling is the word. I also feel a need to be wilder and more adventurous. Here is my dream catcher. 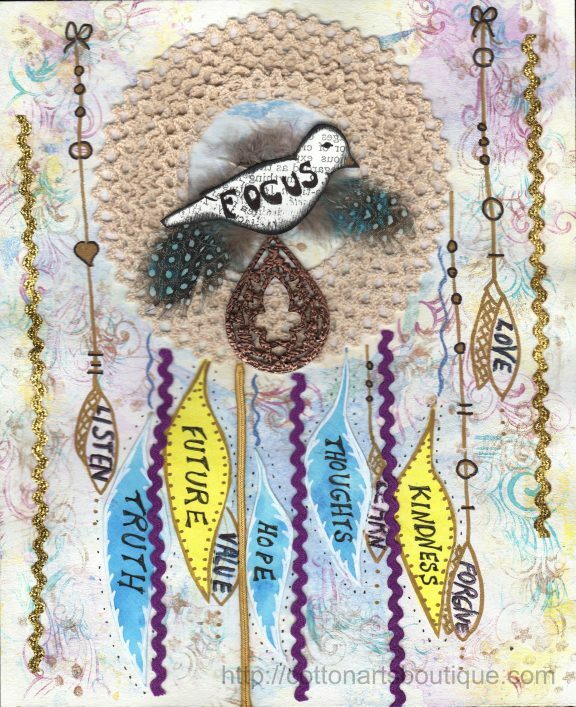 I love the lace and the feathers and bird in the middle but my background and feathers need to be bolder and wild. I wasn’t going to post this piece and then thought … “It is part of my journey” …so it is here although it feels unfinished. This was a fun lesson but obviously painting with acrylics is still an issue with me, always has been. I tend to make acrylics into paint book figures and that is what has happened to this little girl. She has a sweet face but there is no maturity in the piece. Practice, practice, practice with acrylics. She reminds me of one of my paper dolls. 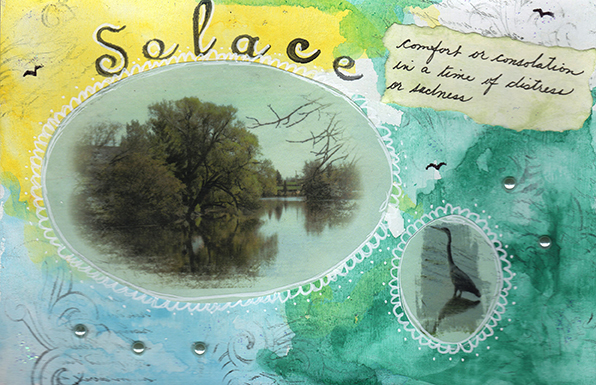 Solace means quiet, respective contemplation and who better to display this but a Blue Heron sitting waiting for his dinner to swim by, so very very still. Appleton is where the photo was taken, a pretty little town in the Ottawa Valley. It is the same photo I used for the digital piece as well. 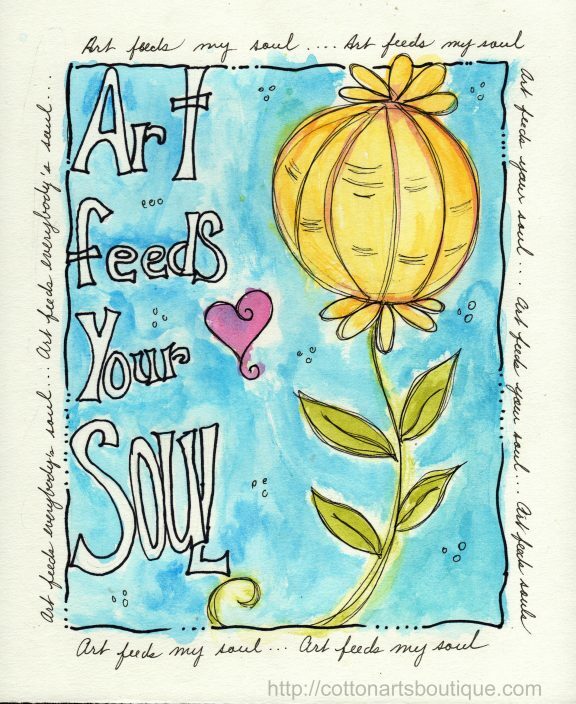 This page was created for the Art For the Creative Mind yahoo group for January. This was such a fun lesson I made two. I love working with lettering and love to doodle the alphabet but this lesson was hard for me to do at first until I figured out that I wasn’t relaxed doing it. Once I relaxed I didn’t have any problems. For the water colours I made my own palette using waste water colour paper and applying the colour to that and picking it up from there into my brush. I will never buy another water colour palette again, this worked so well. This page is right from the lesson. I love working with water colours. I left the letter on this one blank but I think they look bare and need work. I have to leave them for a couple of days to decide. 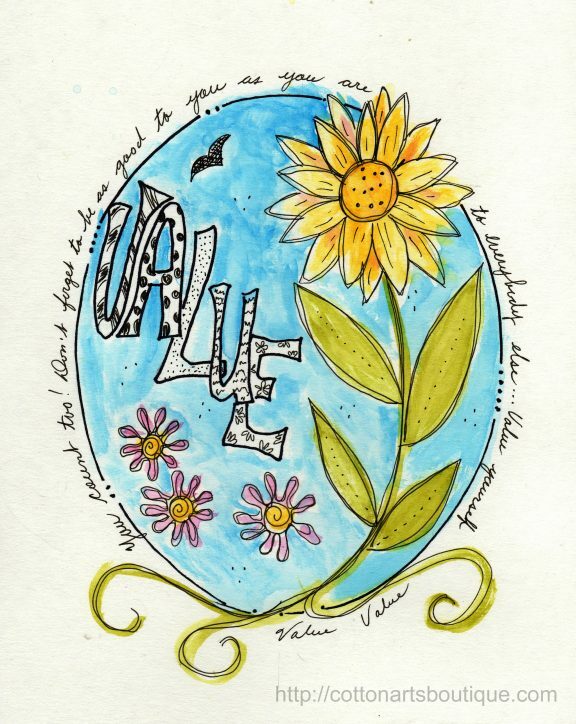 I wanted to do an oval piece with my chosen word “Value”, which reminds me to value myself and treat me like I treat others in my life. 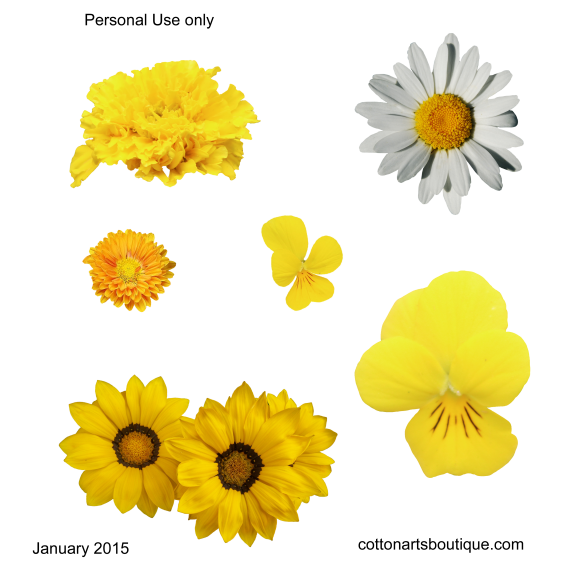 Bright yellow flowers for a very cold cold January to make your scrapping pages wonderfully sunny. Pixel Scrappers is calling for an extraction of our choice as a designer challenge. This is my contribution. Don’t forget they are for personal use only, no commercial or sharing in your free kits.